... and the sixth person to comment was Erin C. Young! Erin, I'll be emailing you to get your contact info and get this cool dinosaur in the mail for your son. For those of you who have dinosaur and car-loving kids, but didn't win the giveaway, definitely check them out on Amazon . 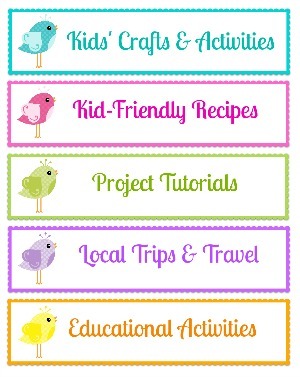 They really are cool little toys and I'm sure your kids would love them. 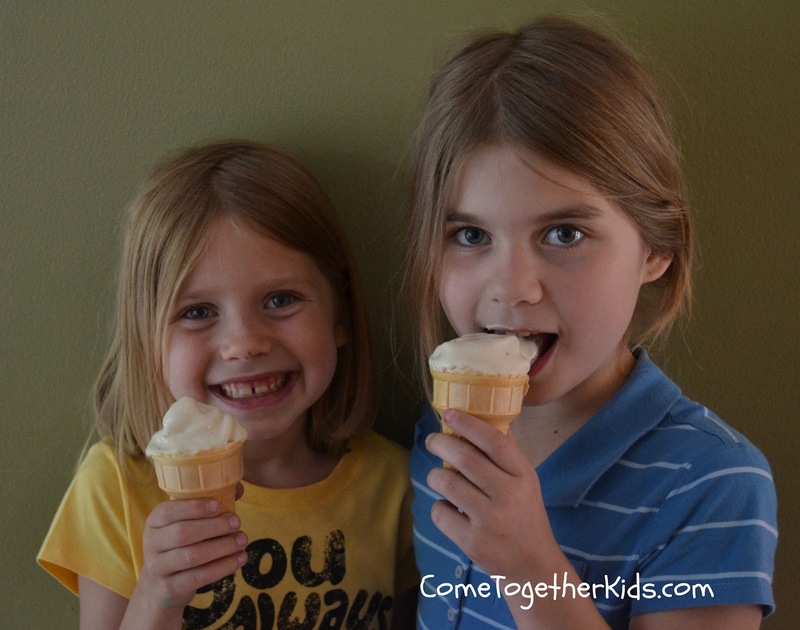 My kids and I love getting in the car and discovering new places together. Whether it's a kid-friendly museum or an outdoor adventure, it's fun to explore new places and see new things. 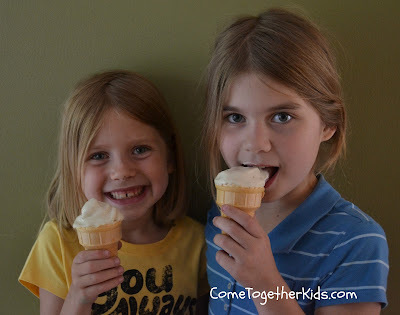 Many times we just head out for an afternoon or day trip and we're back home by dinnertime. Other times, it's nice to plan a little mini-vacation and spend a few days seeing new places. 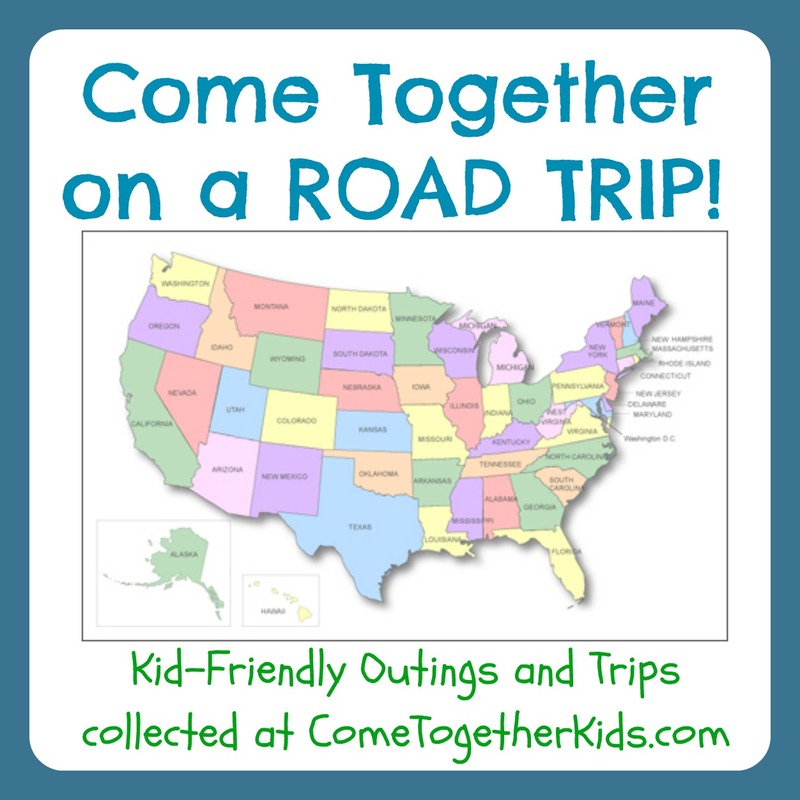 We almost never take a one or two-week vacation as a family, but rather several two or three-day road trips spread out throughout the year. Whenever I set out to plan one of these road trips, I often sit down with a map and draw a circle that goes 3-4 hours out from our home here in Maryland. Then I'll look to find interesting places to visit within that radius, knowing that we'll see some fun sites but we won't be spending forever driving in the car to get there. The problem with planning these trips is finding a good variety of sites to see within a certain area. I might find a cool park that would be fun to see, but then I have to spend hours online to find something else nearby to see the next day. Or I'd end up worrying about finding a decent hotel or restaurant. Imagine then, how excited I was to find out the great resources for roadtrips at visitPA.com. You see, Pennsylvania falls right in my ideal 3-4 hour radius for trips. 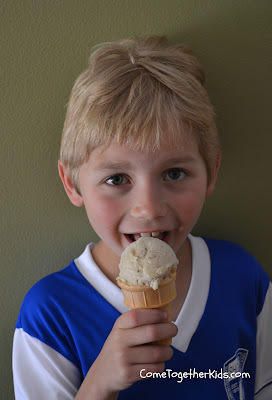 We have family near Philadelphia and also in Western PA so we frequently travel in the state and we're always looking for new places to visit. I tell you, the folks who designed this Roadtrip-a-Matic for pa-roadtrips were some smart people who really wanted to help make travel in their state easy. There are a ton of ready-made road trips all planned out for you. There are some trips that focus on outdoor activities and others that focus on food or shopping. They have planned out activities for history buffs or art lovers. Seriously, it's really cool! Most trips are designed to be accomplished in two or three nights and each one has a variety of interesting sites included. They even suggest restaurants where you can stop for dinner and hotels that are close by. I played around with the Roadtrip-a-Matic and I'm really excited for summer vacation so we can go on a few trips together. I love the Kidslvania Trip to Philadelphia that they suggested. I've been wanting to take them to see some of the historical sites in Philly and the guide gave me suggestions for those and other fun places nearby. 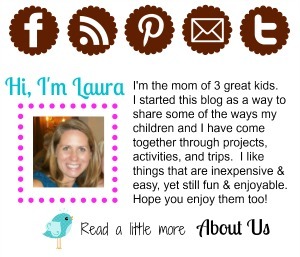 I also loved the Trails Trip in the Laurel Highlands. We drive right through that area to visit our family near Pittsburgh, next time we'll be stopping on the way out to see some of the gorgeous hikes and trails they suggested. It's great that all the planning has been done for me ~ all I have to do is pack our bags! How about you? Are any of you planning a trip in Pennsylvania soon? If so, check out their cool trip planning tool. 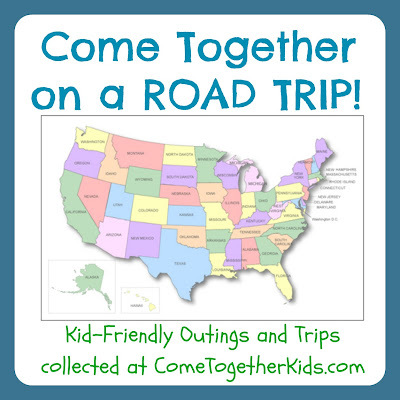 Which road trips would you and your family like? 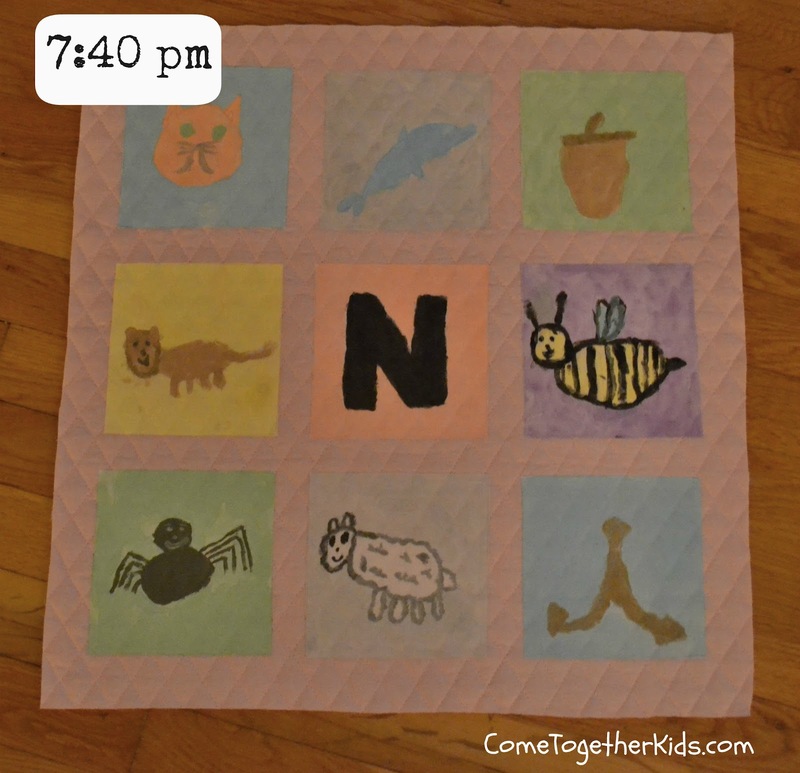 This is a Sponsored post written by me on behalf of VTechKids for SocialSpark. All opinions are 100% mine. At some point in nearly every boy's childhood (and in many girls' childhoods too), there begins a fascination with two things ~ dinosaurs and cars! At some point in nearly every adult's time as a parent, they discover the wonder of the Vtech brand. Well, the folks at Vtech did it again. 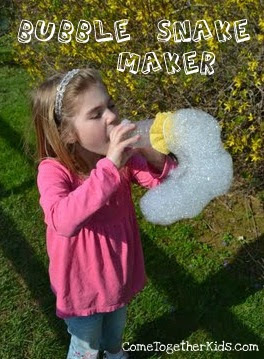 The brand that's a favorite of so many parents and kids combined two of a child's favorite playthings into one cool toy. 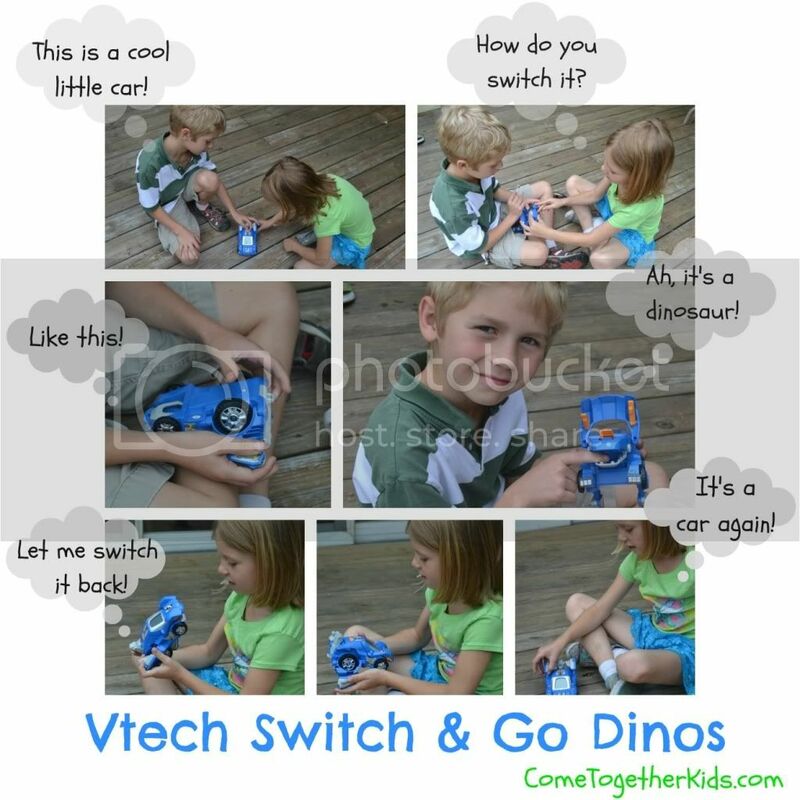 My kids and I recently had the chance to check out two new toys in Vtech's brand new line ~ these cool Switch & Go Dinos. With a few simple twists and turns, they switch back and forth between dinosaur and car. With a push of a button, a neat little LCD screen will show different facial expressions for the dinosaur and drivers for the car. With a push of another button, sound effects bring the toys to life with up to 30 fun little phrases and different dinosaur facts. We had so much fun testing them out and seeing all they could do. Aren't they cool? I loved the way my son and daughter played together with Horns the Triceratop. They really liked switching it back and forth from a dinosaur to a car, and the sounds effects and LCD screen were a cool extra feature. Can't you see the little dinosaur lover or car enthusiast in your life just loving these? When I said these were part of Vtech's brand new line, I wasn't joking. The four Starter Dinos: Sliver the T-Rex, T-Don the Pteranodon, Tonn the Stegosaurus and Horns the Triceratops just became available on May 21 exclusively at Amazon.com for a suggested retail price of $15.99. 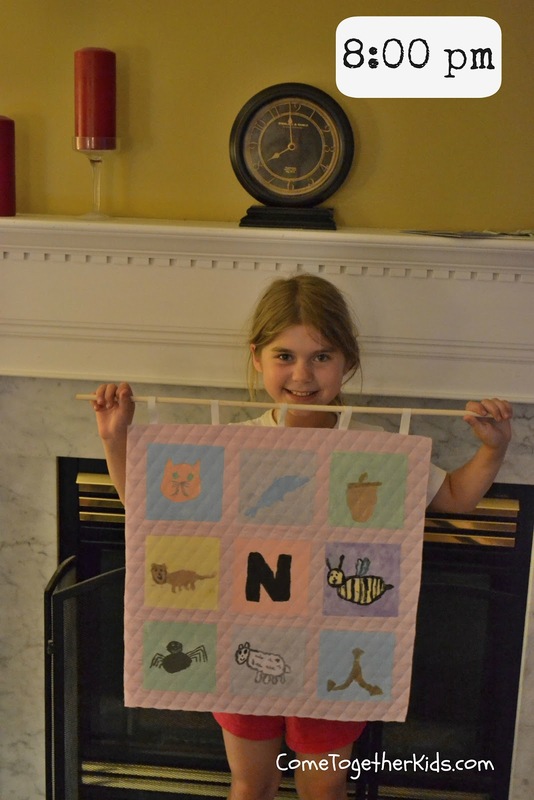 Beginning June 18, they’ll be on sale at VTechKids.com and they'll be available at major retailers in Fall 2012. Also available in the Fall will be Attila the Ankylosaurus (SRP: $24.99), Span the Spinosaurus (SRP: $29.99), Brok the Brachiosaurus (SRP: $49.99) I can totally see these being the hot toy this season, so I think it's cool that you can Buy today on Amazon and then add to your child's collection this Fall. Okay, now if you're an observant reader, you may have noticed that I said I got two new toys from the Vtech line, but I only showed my kids playing with one of them (Horns the Triceratop). That's because I saved one of them for one of you!! You see, I just recently passed 5,000 Facebook followers! That milestone is just so amazing for me and I'm so grateful to have so many of you stopping by to check out our ideas. I'm sure that a good percentage of those 5,000 moms, dads, grandparents, teachers, nannies etc. who have liked us on Facebook have a dinosaur and car loving kid in their life. So, I have Silver the T-Rex here and ready to giveaway to one lucky reader. 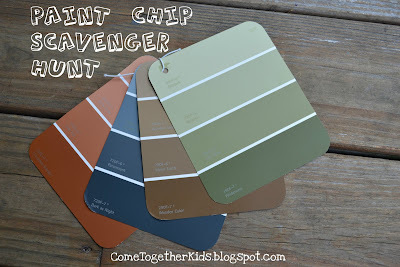 All you have to do to enter is leave a comment telling me who he would make the perfect gift for! That's it! (Of course, I hope you're one of our followers on Facebook. If you aren't yet, please go ahead and "like" us) Make sure you're profile is linked to an email address or leave your email address in the comments. I'll accept comments until midnight (EST) on May 30, 2012 and announce the random winner on May 31st. In the event that I can't contact the winner by June 3rd, I'll choose another winner. This weekend marks the "official" start of the Summer Barbeque season. 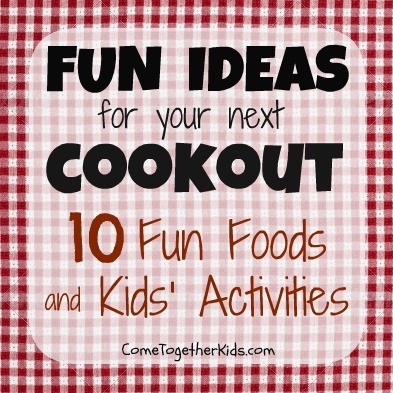 To celebrate, I've put together these 10 ways to make this year's cookouts more fun than ever! 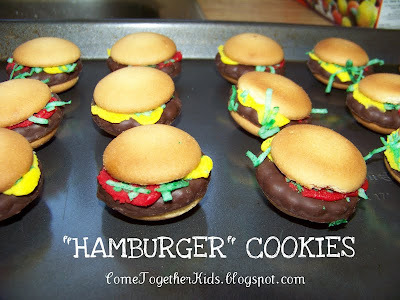 Wouldn't these cookies be so much fun at a cookout? 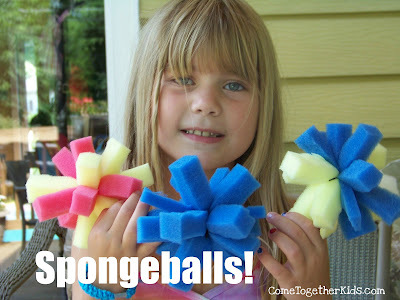 They're really easy to make . 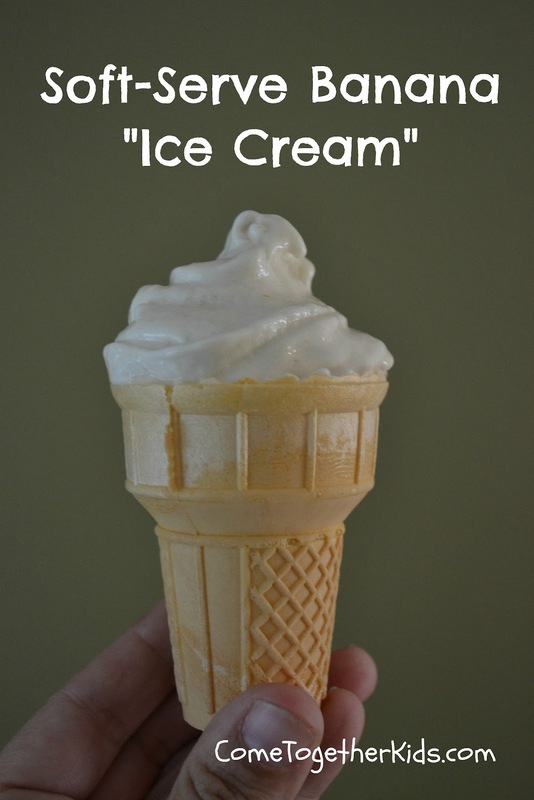 Find out how we made them HERE. make a tasty BBQ treat! but I used the tutorial from HERE at Sun Scholars. 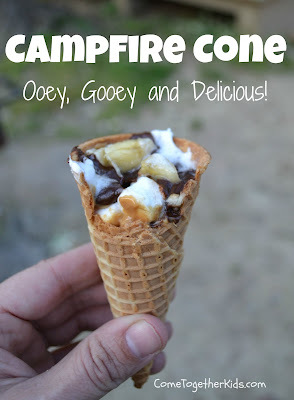 make up a few of these campfire cones. 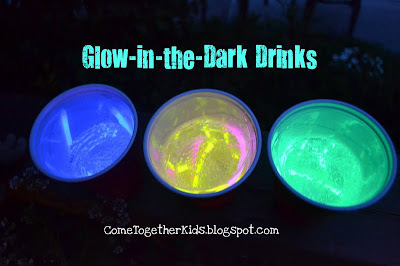 make up some of these glow-in-the-dark drinks. Check out the simple instructions HERE. but last a lot longer? they can be thrown over and over again! Directions to make them are right HERE. 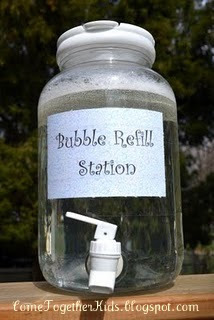 solution to spilled bubble juice. and some liquid dish soap. and have them search for things that match. Check out our post on it HERE. 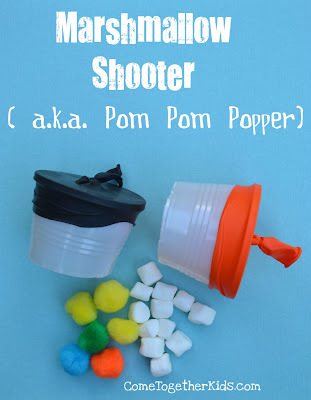 Finally, one of our favorites, these marshmallow shooters. and a balloon to make these cool launchers. You'll be amazed how far they can shoot. these will be a huge hit. Okay, there you have it. 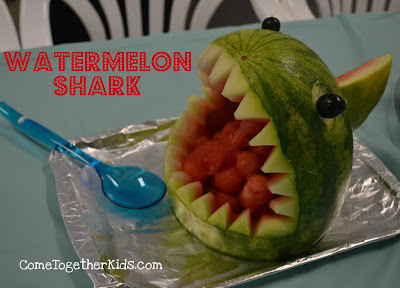 Five fun foods and five fun activities to make your next cookout a hit for both kids and adults. my oldest daughter is just like me. I will readily admit that I'm not the most organized person. I try, I really do, but I'm terrible at remembering to RSVP or bring back library books on time. I always wait until the last minute to do things. I think many times I come up with my most creative solutions at the 11th hour, but you can pretty much count on me to be a frazzled mess at 2 in the morning before any big event or deadline. Unfortunately, it's hard to teach an old dog new tricks and this old dog has just come to accept that she works well at the last minute and the chaos that sometimes results is just a fact of my life. It was a little sad though, to see my puppy acting the same way. 11:30 am ~ I'm at her school ( I work there part-time) and after seeing her teacher in the hallway, I learn that we were mistaken, the quilt project is due first! Instead of having two more evenings to get it done, it was due the next day. (YIKES!) I realize we're going to have to scrap our plans to do a glue batik project like we'd be planning and come up with Plan B. 1:00 pm ~ I get off work and go right to JoAnn Fabrics to pick up the materials for Plan B ~ prequilted fabric and some Heat n' Bond. 4:30 pm ~ My daughter gets home on the bus. ( A big downside to not starting school until 9am is the late dismissal time). As she comes up to the door she has a slightly worried look on her face. "Um, Mom, I made a mistake, my quilt and report are due tomorrow and my book commercial isn't due until Friday. " 5:15 pm ~ I quickly heat up some frozen kid dinners that I keep on hand for emergency situations like this and feed my younger two. Notice the apple core? I told her she couldn't eat dinner until the painting was done. 6:30 pm ~ All the painting is done and she and I break for something to eat. 6:55 pm ~ The paintings are dry and I iron some Heat n' Bond Ultra hold onto the backs and cut out the squares. 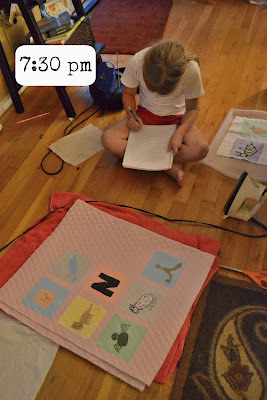 7:15 pm ~ She helps arrange the quilt squares onto the prequilted fabric. 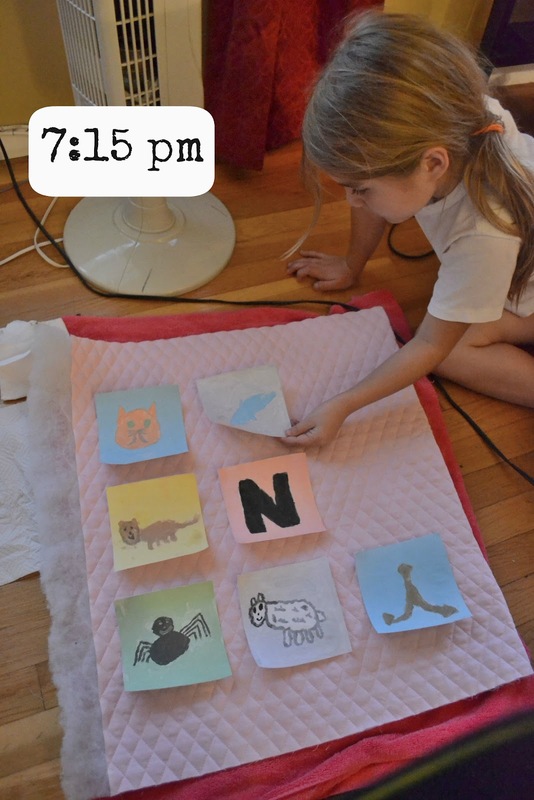 7:30 pm ~ She works on writing all her research notes into paragraph form, while I iron on the squares. 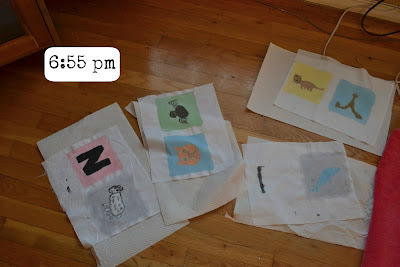 We wait for the paint to dry on the two squares we'd forgotten about and then put the Heat n' Bond on them. 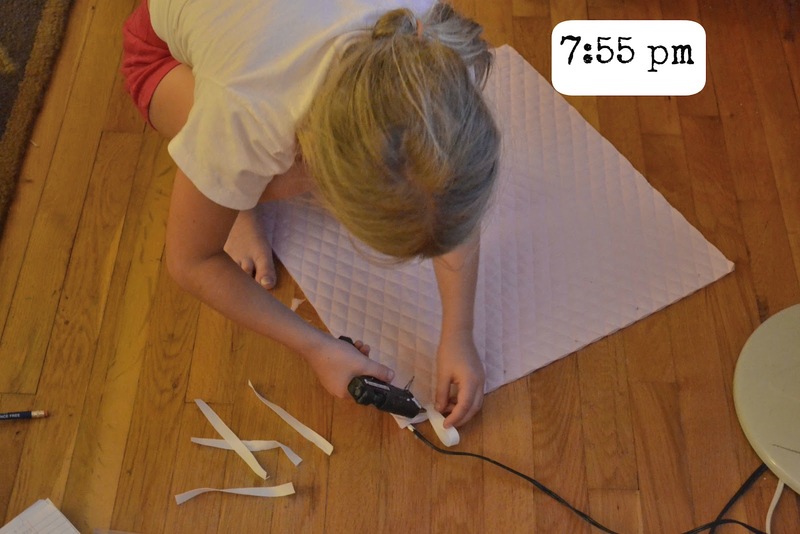 7:55 pm ~ She's finished writing up her report and hot glues some loops of ribbon on the top of the quilt. I dig around the craft room and find a dowel rod that's the perfect size. How about you? 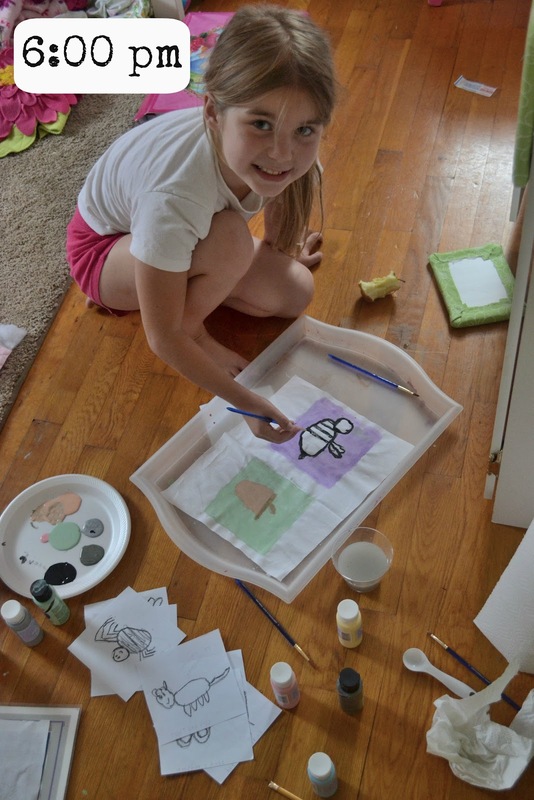 Have you noticed that any of your less desirable character traits are showing up in your own kids? 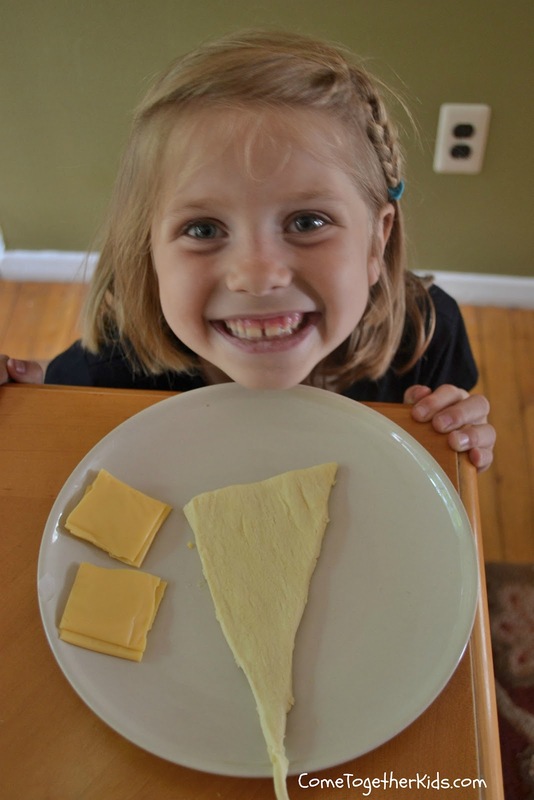 Like most kids (and many adults), my children love grilled cheese sandwiches. 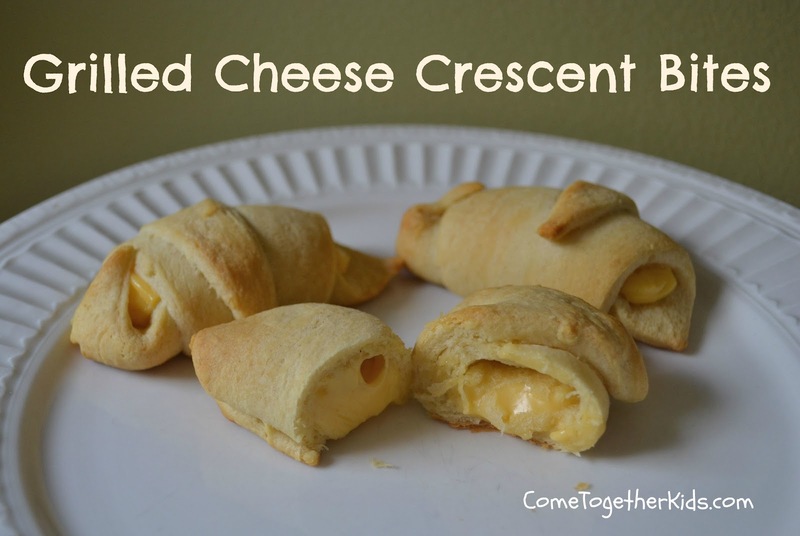 There's something about the ooey, cheesy goodness that just brings comfort and happiness to your kitchen, especially on a dreary day. While my kids like eating the grilled cheese sandwiches I make, I'm not really comfortable letting them stand in front of a hot frying pan to make their own. We decided to come up with a more kid-friendly version they could help make using another one of their favorite ingredients ~ crescent rolls! They're easy, yummy and perfect for kids and adults! 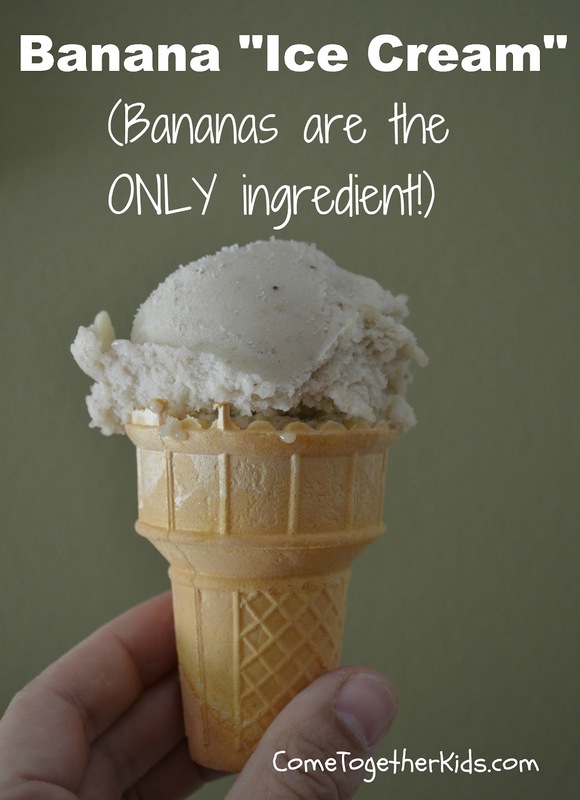 Don't you love two ingredient recipes? 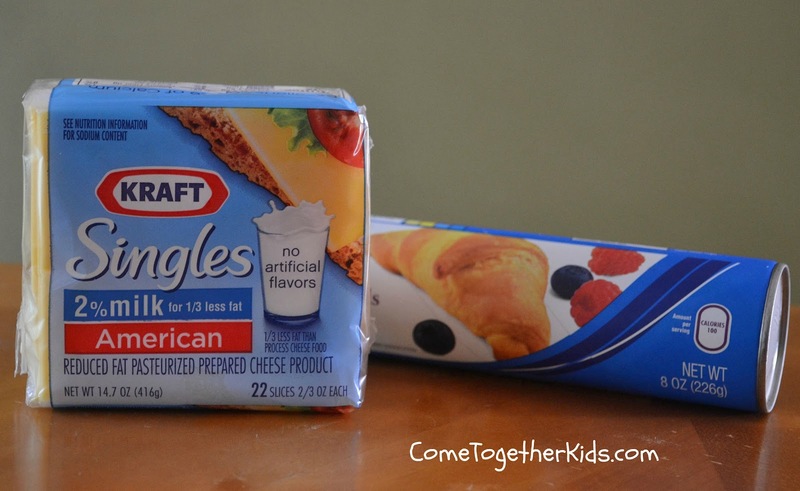 Get yourself some KRAFT Singles (the best for grilled cheese making!) and a package of crescent rolls. 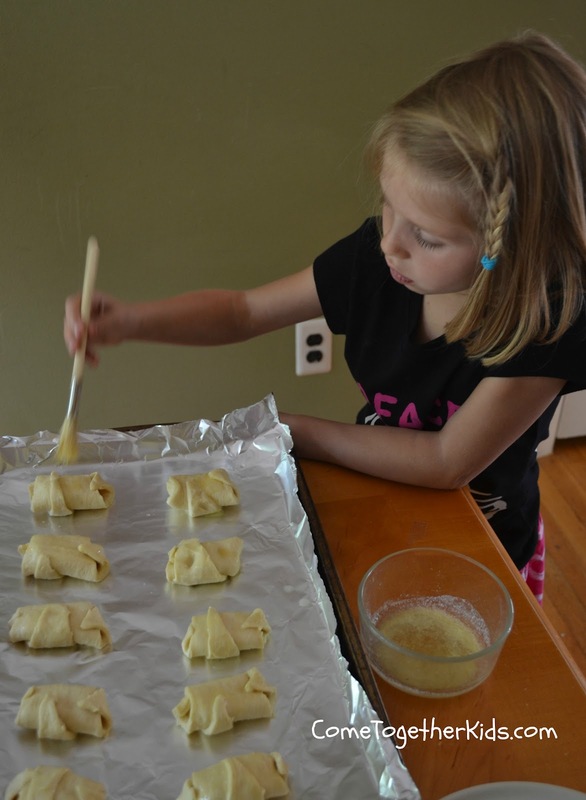 If you're lucky, you'll also be able to enlist the help of a talented young chef. 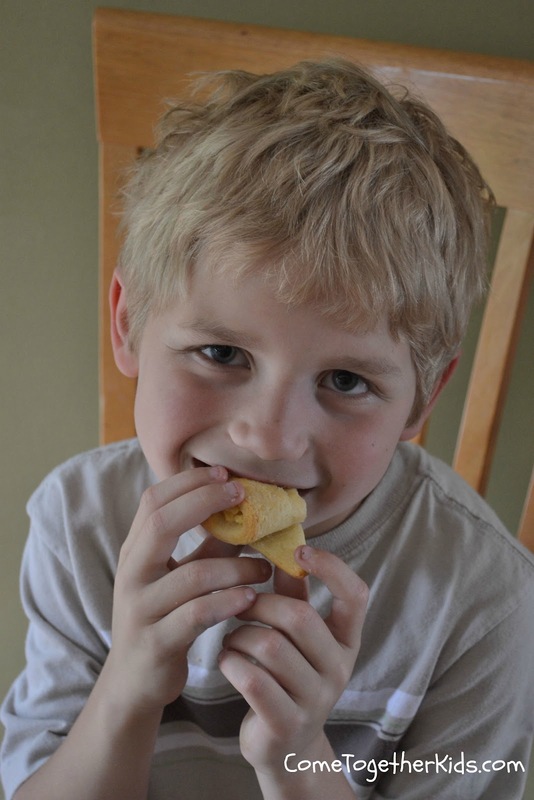 You'll use a half slice of cheese in each roll. 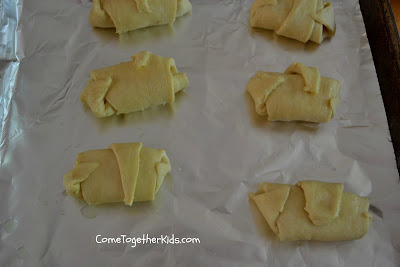 We folded them into halves, then quarters, and then in half again before putting it on the crescent roll. 2. 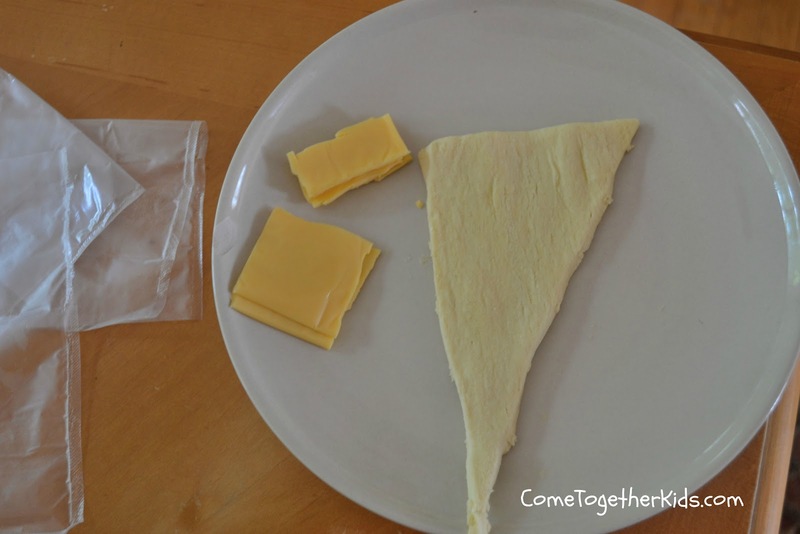 Next, begin rolling up your dough with the cheese inside. 3. 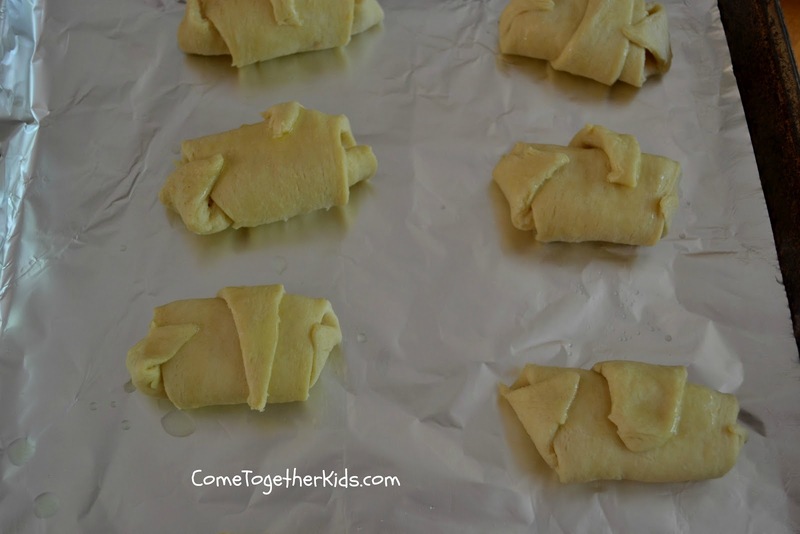 Put the rolls on a baking sheet and brush with melted butter. (optional, but yummy). You could also sprinkle with a little extra parmesan cheese, garlic salt, etc. 5. 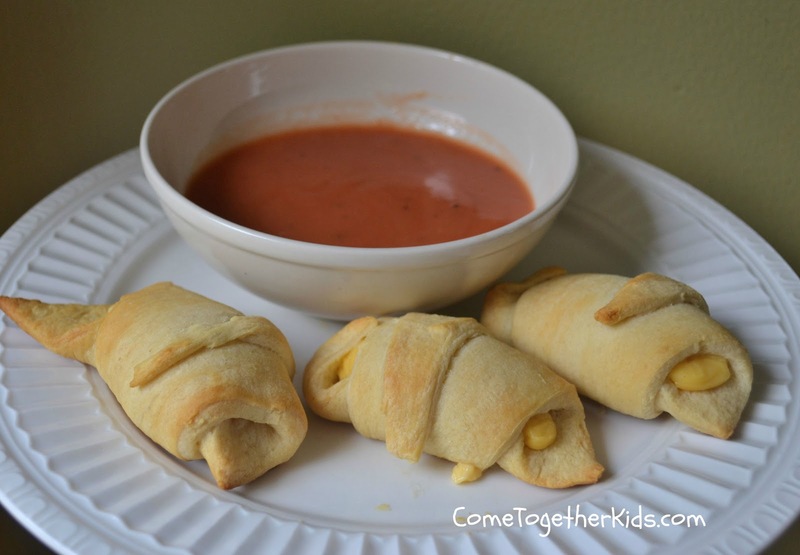 Serve with some tomato soup and you're good to go! 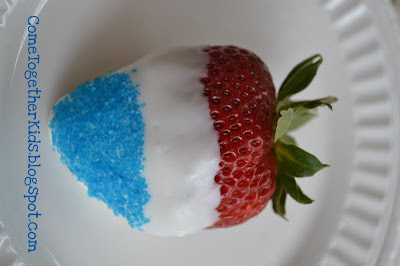 We'll definitely be making these again, they were a huge hit with the kids. 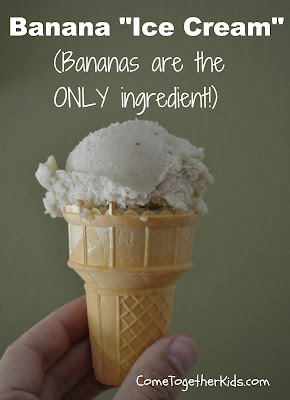 My oldest daughter also made a great point while eating hers. She said these would be "really good for a party if you have a lot of people because you could make a whole bunch of grilled cheeses at once and they would all be the right size." I totally agree with her! 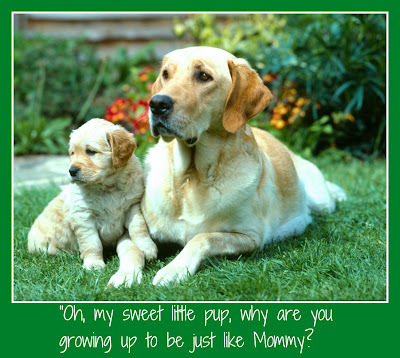 A quick cute story... When she was younger, my daughter was convinced the sandwiches were called "Girl" Cheese and insisted that I needed to make something else for her brother instead. 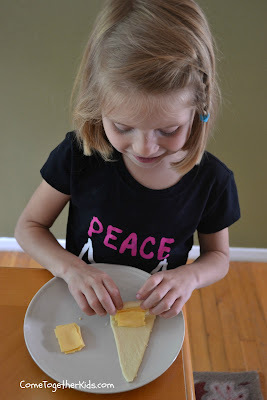 Even though she now knows the correct pronunciation (and allows her brother to eat them), we still call them "Girl Cheese Sandwiches" as a family joke whenever I make them. When we made this new version the other night and my son ate about 6 of them, we jokingly said we should call our new recipe "Boy Cheese Bites". One happy boy with his "Boy Cheese Bites"
I received a coupon for free Kraft Singles and a stipend."